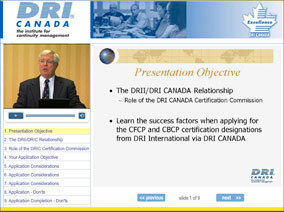 DRI CANADA congratulates those of you who have already earned your DRI Certification. For those of you who have not, if you meet the criteria to do so, we encourage you to make the commitment now and become a certified professional. You will not regret it! Step 1: A passing grade on the DRII Qualifying Examination is sufficient to verify a candidate's knowledge of the subject matter. Step 2: An application is required so that a DRIC Certification Officer can confirm the eligibility of an each candidate. ** You must create a MyDRIC (dri.ca member portal) profile to submit your application. Step 3: For Non-Associate level certifications, additional information is required so that a review panel can confirm the experience of an individual candidate. Treat this process as a written interview. Ensure you map your experience to the DRII’s Professional Practices and you will be successful. * Work experience must be gained within the ten year period preceding the application date for certification. Step 4: You must pay for the application processing online after you finalize your application. * We will not refund the fees to process your application so make sure you are eligible and ready to become a DRIC certified professional before you apply. ** The DRIC application processing fee includes your first year of membership! Please take a look at the DRIC certification matrix to find the appropriate type and level of certification for you. Review eligibility criteria for the selected Certification in the details! This entire process can take several weeks. The DRIC Certification Officer contacts all candidates who have submitted incomplete applications. The Certification Commission will reach one of three decisions: awarding the Certification requested; awarding a lower Certification, or denying Certification. The Certification Commissioners will carefully consider the evidence supplied by the candidate and allocate an appropriate Certification grade based on evidence supplied within the application and supporting documentation. The Commissioners are not permitted to research an individual. Agree to abide by the DRIC Code of Professional Ethics. Agree to abide by the DRIC Continuing Education Policy. Learn how to prepare your application by clicking on the image below. Disclaimer: Resumes are no longer required and all applications are to be completed online here. Use this template to gather and review the content for your online application in advance and then just to copy and paste in online form.